This post was originally published on Eco-Libris blog on April 27. I love bears. Polar, Panda, Brown – you name it. Therefore I was immediately was fond of our books this week – a children’s book that takes place in a little bears’ heaven and where the main characters are bears (and very funny ones!). We mentioned it firstly last month when we announced on a collaboration with the author who plant a tree for every book sold on her signing events and provides buyers of the book with our sticker (made of recycled paper), saying: “One tree planted for this book”. Jeanne McNaney lives in Greenwich, Connecticut, with her husband, Joseph, and their three children. In addition to her passion for raising awareness about the environment and the plight of endangered species, she is dedicated to causes that enhance the lives of children and their families throughout the world. David Cochard has been a freelance illustrator since 1996. He currently resides in Argentina with his wife, Sandrine, where he runs his own illustration company, Ilustra World, and pursues his other passions-traveling and studying science and ecology. What this book is about? Honey Hollow is not a place known to humans, but it is well-known to the bears of the world. Bears travel to this beautiful forest sanctuary to escape habitat destruction and global warming. The magical paradise has now been discovered by man. When the trees are cut down by developers, can the bears and the children of the loggers join together to save Honey Hollow for the future? Why you should get it? This is a very moving story for kids and what I mostly liked about it is that although it’s a story for children, it keeps a very realistic ton and is not afraid to present environmental issues in a very frank way. It gets children to face critical issues such deforestation and the impact of human beings on the nature in general and animals specifically. Nevertheless, it’s also a fun story with funny characters that make you laugh and also get you to identify with them from the first page and follow them breathless in their adventures. The author found a great balance between the various elements and the result is a book that teaches kids a valuable lesson about humans-nature relationship and the importance of community, gets them to appreciate wildlife and the environment and at the same time tells them a great children’s story. The author, Jeanne McNaney, said that she hopes the book will bring environmental awareness to a younger generation. I believe this unique story, with its bear characters, the beautiful illustrations and the optimistic message that we can still change things and make them better is doing a great job in increasing the awareness of youngsters and educating them to do the right thing. And last but not least, the book is printed on environmentally-friendly paper and a percentage of all profits from the sales will go to organizations that support wildlife conservation and endangered species preservation. What others think about the book? We’re giving away one copy of the book, courtesy of the author, Jeanne McNaney, and of course a tree will be planted for the copy! How you can win? please add a comment below with an answer the following question: what is the best way to teach children to appreciate wildlife? Submissions are accepted until Sunday, May 3, 12PM EST. The winner will be announced the following day. The best way to teach children to appreciate wildlife is to expose them to nature and show appreciation yourself. I teach kindergarten. We can’t take field trips but I read tons of books and we discuss them. I use videos when I can. I also use my real experiences to share. Oh, and guest speakers with animals whenever we can!!! Children learn by watching their parents so if you treat wildlife w/ respect they will do the same. Feed the birds and squirrels if you have the chance. Take kids to visit a wildlife park if there is one in your area. And never speak badly of animals in front of children.Watch Nature and Nova on Public television as a family. I think the best way to teach children to appreciate wildlife is through children’s books that tell fascinating animal stories that spur children’s curiosity. Stories to which children can relate help as well. It’s important to spend lots of time outdoors observing wildlife. Encourage children to think and question the ways of animals so that they can understand them better. 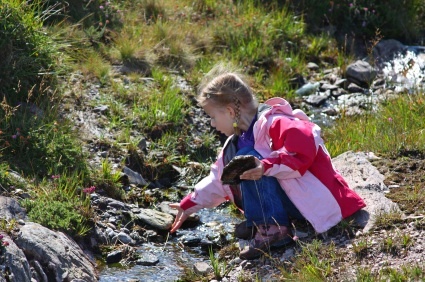 A deeper understanding will lead children to compassion and appreciation for wildlife. We also subscribe to children’s wildlife magazines. My children look forward to receiving them in the mail and spending time reading and looking at the pictures. Thanks for this great giveaway!